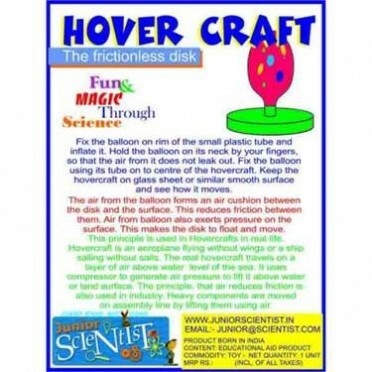 Hovercraft is a popular scientific toy, this toy has been developed on the basis of a particular science principle. It is suitable for daycare projects, science projects (aerodynamics and gyroscopes) as well as general fun. Content : Hovercraft is a popular scientific toy, this toy has been developed on the basis of a particular science principle. Features : It is suitable for daycare projects, science projects (aerodynamics and gyroscopes) as well as general fun. Do - it - Yourself kit to build your own Hydraulic BrakeAge Group : 8 Years to 11 YearsBattery ..